Welcome to Day #4 of Chocolate and Hazelnuts Theme Week. 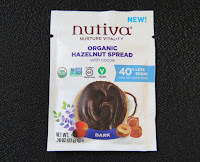 Today's Organic Hazelnut Spread was from Nutiva (Richmond, CA). This organic, vegan and certified gluten free chocolate hazelnut spread had "40% sugar than the leading brand." What's not to like? The creamy, oily spread with cocoa did have a more natural, satisfying taste than most spreads. It was chocolate and sugar forward, but lacked the consistency of hydrogenated fat with additives or emulsifiers (thank you). 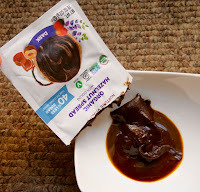 The ground hazelnut flavor was less pronounced, in part due to subtle flavors of the oils (palm, coconut, chia seed) and other ingredients (flaxseed and carob flours). The single-serving packet was a good size for a snack or lunch or trial taste. However, I was reminded, open packets with care or you may have a spray of tiny dots of Nutiva spread (or the oil portion if it's separated) on your shirt/pants.